This enclave of rich heritage, located on the left bank of the river Cea, was, for centuries an important refuge for pilgrims, a Jacobean importance still evident despite, at present, not retaining as much fame as in its glorious past. For many pilgrims, and because of the contemporary distribution of stages, Sahagun is no longer a frequent ending stage, something that contrasts to references in the Codex Calixtino, which concluded Sahagún as the seventh end stage. In any case, the location provides an important hospitality infrastructure and services. Historically, since Roman times the centre has shown great vitality since, mainly thanks to its easy access roads that cross the peninsula. In this place the saints Facundo and Primitivo (Century II / III) were buried, the two martyrs were beheaded, and their bodies were thrown into the river after proclaiming their Christian faith. Their tomb became a shrine venerated by the faithful, which led first to the construction of a church and, years later, a famous monastery, which in the eleventh century became the Abbey of Cluny, one of the most powerful kingdoms and a major hospital for pilgrims. This order was one of the main drivers of the Camino of Santiago during those centuries, an unequivocal fact of the important role played by the enclave on the Jacobean Camino. With regard to medieval legend, Sahagún is also renowned. It was here that the last events surrounding the epic Carlomagno along the Camino are situated. The French emperor, with his troops faced the Moor king Aigolando and his army in a combat that killed 40,000 Christians, including the Duke of Milo (father of Roland) and Carlomagnos own horse. 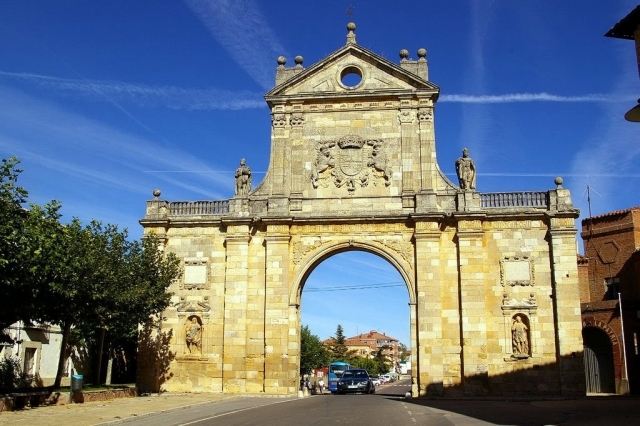 The pilgrimage route bids farewell to the Carolingian episodes in Sahagún and also begins to say goodbye to the region of Tierra de Campo on this pleasant urban route that will lead to a bridge, from where the Camino continues. This small town has a number of celebrations throughout the year, among which some serve to enhance its long historic tradition and, others its rich culinary heritage. Among the earliest is that of Encuentro de Juglares, celebrated since 2002 and which commemorates the first school of minstrels in Spain, founded in this village in 1116. The biggest cultural celebration and festival of the town, however, is on July the 12th and occurs over six days, during which honours are paid to the patron saint San Juan de Sahagun. The bull runs are the main feature of these celebrations. Easter week in Sahagun also deserves a special mention, well recognized and during which, a religious procession takes place and decorative floats with sculptures that depict different scenes from the bible are carried through the streets. The procession itself generates money from local businesses and visitors in order to ensure its survival. On a more Jacobean note, the Concentración Motera Ruta Jacobea (A Jacobean motorbike Rally) stands out, celebrated in September between Sahagun and Leon. For lovers of burnt rubber, this event has been held for ten years. If you are traveling on the Camino de Santiago or are planning to do so soon, you should know that the distance separating Sahagún from Santiago de Compostela is 366 kilometers.